2012 has been an up and down year for Hollywood’s studios in China, offering a rising bounty of distribution revenues amid a series of sometimes gratifying, sometimes unsettling, but almost always surprising gives and takeaways from the unpredictable Chinese government’s film regime. 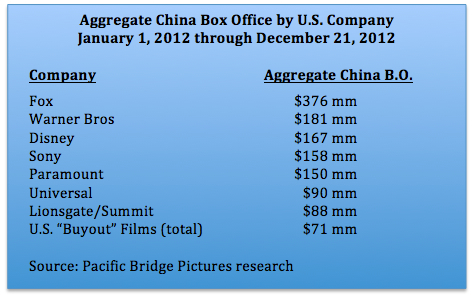 Early on, the Year of the Dragon looked to be a propitious one for Hollywood, perhaps the beginning of a long-term reign of market dominance for American films. But by summer the bloom was off the rose and Hollywood’s leaders were confronted with the question so many ‘foreign barbarians’ have faced throughout history: how to deal with the Middle Kingdom and win. On the positive side, 2012 was the year in which China finally capitulated to years of MPAA and WTO pressure and meaningfully loosened restrictions on the import and distribution of foreign films. On the other hand, it was also the year in which China began making liberal use of blackouts—“domestic film protection periods,” in PRC parlance—to manage the grosses and maintain at least a 50 percent market share for domestically made films. By year’s end the studios had more to worry about in China than they ever did before. None of this would matter so much were it not for the fact that China has clearly emerged as the world’s most important growth opportunity for Hollywood. For more than a decade the mainland’s aggregate box office has grown at a pace three to four times faster than its overall economy, and in 2012 it surpassed Japan to become the second largest film territory after North America. The analysis presented below provides what I hope is a valuable snapshot, and a few useful insights, about where American distributors now stand at year’s end. 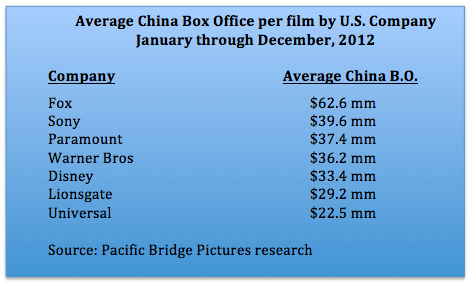 To conduct this analysis I reviewed the box office results of the more than 40 American films that released in China between January and December, 2012. These included both revenue-sharing ‘quota’ films and ‘flat fee’ imports. I classified each film as belonging to a single U.S. distributor, although in some cases multiple companies were involved. In deciding which film belonged to whom I assessed, as best as I could, which company was receiving the distribution receipts from China. While the PRC’s rapidly rising revenue tide has lifted all of Hollywood’s boats, the benefits have not been equally apportioned. Twentieth Century Fox, for instance, grossed more than twice as much in the mainland as second place finisher Warner Bros. Universal lagged behind the other 5 majors, both in aggregate box office and in average gross per film. Although Lionsgate finished just behind Universal, the mini-major has come on strong in recent months to establish itself as a solid player at China’s multiplexes. Some might point to the outlier success of Titanic 3D ($154.8 million in China) as the key driver of Fox’s dominant showing, but the truth is that with its deep bench of strong performers like Life of Pi, Ice Age 3 and Prometheus, Fox would have beaten the others in total box office gross and average gross per picture even without Titanic. While the PRC’s film regulators make efforts to appear even-handed in their dealings with all the studios, it is possible for a U.S. studio to win favor in the form of more rev-share distribution slots and better release dates. Fox, with its investment in local Chinese language films and its acquisition of a stake in Beijing based distributor Bona Film Group, appears to have earned special treatment as the only foreign company to have been granted six rev-share releases by SARFT in 2012. Disney and Warner Bros snagged five slots each, while Sony, Paramount and Universal each got only four. To its credit, Lionsgate won 3 slots with seemingly censor-defying pics as The Hunger Games and Twilight. Another useful measure to examine is China indexing, that is, the share of total worldwide box office earned by each company’s films in China. This figure tells us how ‘China friendly’ each company’s slate has been; the higher the number, the greater the China appeal. 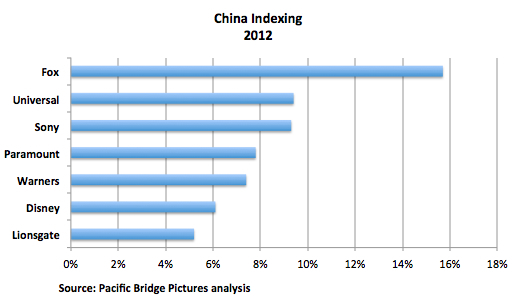 The average index for all studio films in 2012 was 8.8 percent. Fox, again, came out on top by this measure, with its out-sized index of 15.8 percent. Universal ironically took second place because its international dud Battleship over-performed in China. Disney’s big China hit The Avengers was counter-balanced by the company’s under-performing animated films Wreck-it Ralph and Brave. 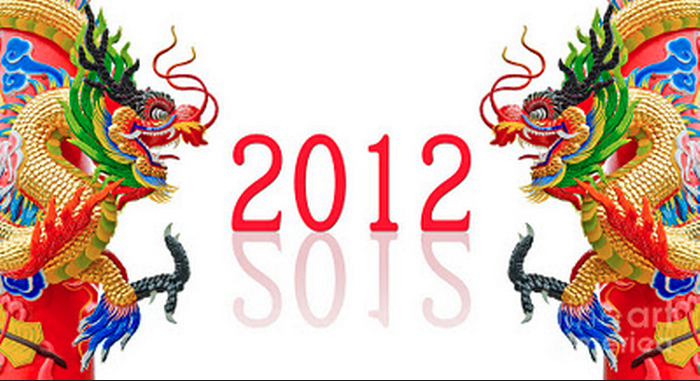 In many ways, 2012 has been a watershed year for Hollywood in China. Whether the studios are on an upward trajectory there or a downward one is impossible to say. But each studio’s fate in the Middle Kingdom is at least partly in its own hands, and 2013 may well be the year when those fates are ultimately decided. This entry was posted in Analysis, General News, Opinion and tagged China indexing, film indexing, Hollywood films in China, MPAA, Rob Cain, Robert Cain, WTO, Year of the Dragon by chinafilmbiz. Bookmark the permalink. You’re welcome, Richard. Thank you for reading! I also kept track of the PRC market and wanted to compare notes with you — while Fox (with 5 releases) is by far the top MPA studio in terms of total PRC BO for 2012 (over 2 billion RMB and about twice the BO versus the next ranked, as you’ve pointed out), I do have Sony (6 releases), WB (5 releases) and Disney (5 releases) as #2, 3 and 4 (all exceeding 1 billion RMB), followed by Paramount (4 releases including the 2 DreamWork Animations titles), and Universal (3 releases). Also, I have Lionsgate with 5 releases in 2012 in China. Ed, why don’t you email me and we can compare notes. I don’t understand your question, but I have added your email address to my distribution list.